Ways to reduce stress for Thoroughbred racehorses. Just like any professional athlete, racehorses are not immune to stress. 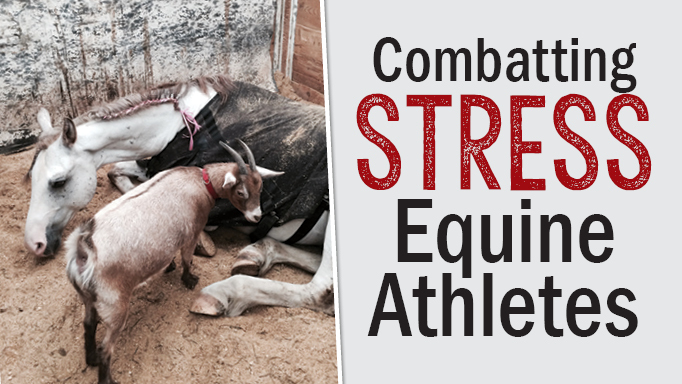 The demands of physical training, the lifestyle they lead, and the pressure to perform are just a few elements that can take a physical and mental toll on the four-legged individual. When people speak about equine athletes, referring specifically to thoroughbreds, they attach certain adjectives to the breed — strong, versatile, and fast. Negative connotations such as anxious, high-strung, or hot, aren’t too far behind, seemingly stitched into classifying thoroughbreds as either having the competitive edge, or being too edgy come race day. Determining the triggers that cause them stress is important, whether the horse is showing signs of aggressive behaviour around the barn or turning in lacklustre performances at the track. Moreover, understanding how to combat the stress attached to these triggers is critical to keeping these athletes happy and healthy. Dr. Candice Allen has worked as a veterinarian at Woodbine Racetrack for more than 25 years and is well-versed on the day-to-day care of these athletes, understanding the basic factors that can contribute to a horse’s change in behaviour and attitude during their racing career. When they are not training, racehorses generally spend a large portion of their time in stalls. “(There is a) confinement issue — in that they’re in their stalls for probably 23 hours a day. The fact that they are a herd animal and not able to be in a herd setting where they are able to interact with their herd mates (is a challenge),” Allen said. She notes that certain elements within a horse’s stall and around the barn can help restore that feeling of assemblage amongst their stablemates. At the Attfield outfit, some horses may get jollyballs or salt licks in their stalls, but the standout feature are the stuffed animals or ‘teddies’ lining stall doors. A seasoned competitor and graded stakes winner, Danish Dynaformer may also be envied by his stablemates. “He’s got two (teddies) in his stall and one that hangs in the front of his stall,” Walker said. “I ride him every single day. He walks in, he hits one with his head on the one wall and then hits the other one, and then he will turn to the third wall and stand. If you don’t let him go in and hit his teddies he will try to bite the groom while you’re taking off his bridle. But if I let him walk in his stall and let him hit his two teddies he just stands there. I don’t know whether it’s habit or comfort, but he loves his stuffed animals,” said Walker. Outside the barn another essential element to help horses relax and decompress from training is the use of a round pen. Working closely with these horses, Walker easily pinpoints a couple of horses in the barn who very much enjoy their reprieve to the pen. While veterinarians such as Allen may use certain tranquilizers such as acepromazine (commonly referred to as ‘ace’) to keep horses calm during medical procedures such as x-rays and ultra sounds, trainers may sometimes use a tranquilizer to prevent horses from injuring themselves during training. It’s important to understand that a tranquilizer helps decrease anxiety, helping a horse to relax versus the use of a sedative which provides pain relief but makes a horse somewhat sleepy after being administered. It is equally pertinent to acknowledge that tranquilizing horses is done at the discretion of trainers. According to Allen, if a horse is still a little excitable after a race, a trainer may give them a little bit of tranq. While tranquilizing does serve a purpose it remains only a temporary and short-term fix. Trainers need to think outside of the medical toolkit when a horse is constantly in a fractious state of mind. One tried and true solution appears to be the use of a companion animal. Enter Xola, a Nigerian dwarf goat that has taken up residency at Julio Silva’s barn at Hastings Racecourse. “We originally bought her for a horse by the name of Veni Vidi Vici. A nice little horse that we used to have, he was a little sprinter, but he was a little bit hot,” said Silva’s wife, Claire Hills-Silva. While not a new discovery, companion animals such as chickens, cats, pigs, goats, mini ponies or even a pony continue to play a vital role in keeping certain racehorses calm and at ease in the barn, during their training, and travelling to other racetracks. Several notable horses such as 2010 Breeders’ Cup Marathon winner Eldaafer, travelled with his goat companions Google and Yahoo. Likewise, historic champs such as Triple Crown winner Seattle Slew travelled with his pony Steamboat, while American Pharoah travelled alongside Smokey. Claire has found that Xola has had a positive affect on not just one horse, but the whole barn. “They all like to hang out and eat out of their hay nets with her. She will stand underneath their hay nets and they usually put their heads down and eat the hay off the ground with her,” Claire said. 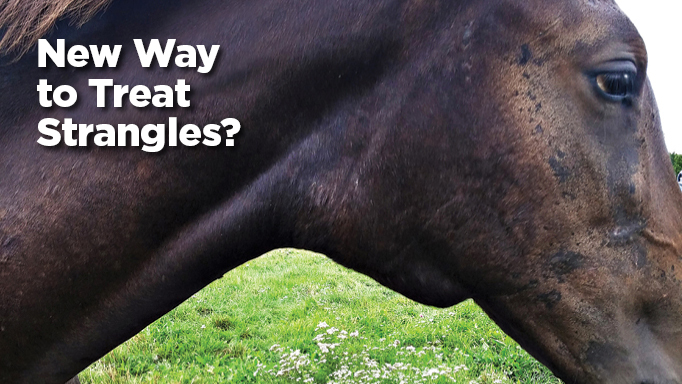 While companion animals will do the trick for some horses, others are an enigma where triggers aren’t so obvious to either the eye or ear. Woodbine trainer John LeBlanc Jr. knows this all too well, specifically with regards to one of his prior trainees named Bug’s Boy whose racing career had several bumps in the road from the get go. As a four-year old in his first race he took a bad step on the turf and tore his tendon. That injury would take him out for remainder of the season, but LeBlanc, who saw potential in the horse brought him back to training the following year once the tendon healed. While conquering his physical issues were one thing, Bug’s Boy then started to develop another issue that had both the trainer and his various riders puzzled. “Each rider kept saying he’s full of run, everything is fine, he feels great, but he started stopping down the stretch,” LeBlanc said. After giving the horse the day off, LeBlanc went back to the drawing table and rode the horse to the top of stretch to figure out what could possibly triggering the horse to stop moving forward. A lightbulb moment for the trainer, LeBlanc sent out the horse in a $25,000 claiming race on Nov. 30, 2008 giving Husbands specific instructions not to push him. While the new method worked for Bug’s Boy, who ran his best race finishing a game second, the plan unfortunately backfired for both the trainer and jockey. The stewards felt that the jockey wasn’t persevering with the horse and possibly because Simon’s brother, Patrick, who won the race, was riding for the jockey’s title. “We got beat ¾ of a length and our horse ran the best race of his life, in our opinion, if you knew the individual and you knew what was happening and the history of his very first race to where we were,” LeBlanc said. Simon Husbands was handed a one-year suspension for that ride, but appealed and was exonerated later that year. Bug’s Boy who finally broke his maiden at 6, went on to win the 2011 Halton Stakes two years later, beating Charles Fipke’s champ, Society’s Chairman. The dark bay gelding ran 55 times over his five year racing career and retired at the ripe old age of nine, banking just shy of $300,000. Not too shabby for a horse that was originally purchased for $2,711 and also had the hosts of issues the trainer had to tackle while he was in training. Looking back, LeBlanc knows that he was simply trying to understand why the horse was failing to fire. LeBlanc also acknowledges several other factors played a role in the gelding’s stress level. Nonetheless, LeBlanc never gave up on Bug’s Boy. Owned by his wife Maggie and son Douglas, the family understood how crucial it was to know which triggers, whether it was a prior physical ailment, his environment, or part of his training regimen, that could upset the gelding’s behaviour and performance. “It’s an important piece, we think. Bug’s Boy, the stress of what he went through and the transition of him dealing with stress and us understanding his stress, had a huge impact on his career,” Leblanc said. While Bug’s Boy enjoys his retirement and residency on LeBlanc’s farm, the trainer has had other quirky individuals to deal with, including a bay gelding by the name of Rocket Plan. Owned by Ron Gierkink, the 2016 Queen’s Plate participant presented a different type of challenge for the trainer. Getting creative, LeBlanc used a bluetooth speaker during Rocket Plan’s training session to simulate more noise and expose the gelding to a colourful array of music that he would encounter on Plate day. “We have bagpipes for The Queen’s Plate. I Googled bagpipes and played those. I played hard rock. I played just a radio station so that the music changed and it went from rock ‘n’ roll, heavy drums — AC/DC type of thing — to the radio announcer, then back into another song,” Leblanc said. While the music did help combat some of Rocket Plan’s stress, LeBlanc also learnt that his trainee enjoyed a different type of companionship on race day. While various elements may trigger and cause a racehorse distress, the common thread to combat that stress circles back to the idea of the herd. In contrast to other professional athletes, equine athletes don’t get to step off the field, head home and hang out with their family. Thoroughbreds literally, eat, sleep and live at their workplace, returning to their family or herd only when an unfortunate season-ending injury occurs, or the end of the season comes calling. 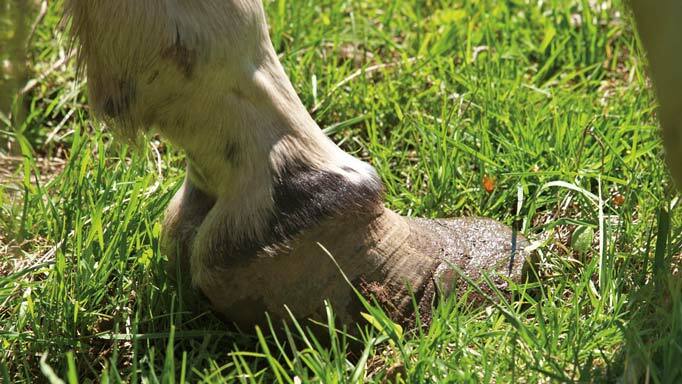 Causes and treatment of this second leading cause of death in horses behind colic. Does My Horse Have a Hernia? 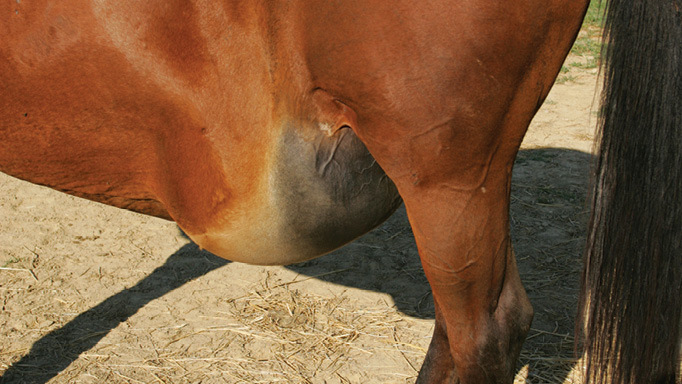 Could that swelling on your horse’s belly be a hernia? Find out how to recognize and treat them. 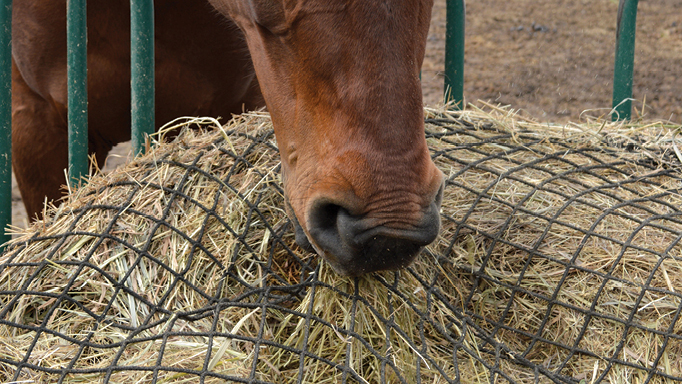 Coping with the group of airway diseases now called Equine Asthma.